HTML was theoretically an example of an SGML-based language until HTML 5, which browsers cannot parse as SGML for compatibility reasons. DocBook SGML and LinuxDoc are examples which were used almost exclusively with actual SGML tools. DSSSL was reworked into[clarification needed] W3C XSLT and XSL-FO which use an XML syntax. Nowadays, DSSSL is rarely used in new projects apart from Linux documentation. SGML descended from IBM's Generalized Markup Language (GML), which Charles Goldfarb, Edward Mosher, and Raymond Lorie developed in the 1960s. Goldfarb, editor of the international standard, coined the “GML” term using their surname initials. Goldfarb also wrote the definitive work on SGML syntax in "The SGML Handbook". The syntax of SGML is closer to the COCOA format. [clarification needed] As a document markup language, SGML was originally designed to enable the sharing of machine-readable large-project documents in government, law, and industry. Many such documents must remain readable for several decades—a long time in the information technology field. SGML also was extensively applied by the military, and the aerospace, technical reference, and industrial publishing industries. The advent of the XML profile has made SGML suitable for widespread application for small-scale, general-purpose use. SGML has features for reducing the number of characters required to mark up a document, which must be enabled in the SGML Declaration. SGML processors need not support every available feature, thus allowing applications to tolerate many types of inadvertent markup omissions; however, SGML systems usually are intolerant of invalid structures. XML is intolerant of syntax omissions, and does not require a DTD for checking well-formedness. While HTML was developed partially independently and in parallel with SGML, its creator, Tim Berners-Lee, intended it to be an application of SGML. The design of HTML (Hyper Text Markup Language) was therefore inspired by SGML tagging, but, since no clear expansion and parsing guidelines were established, most actual HTML documents are not valid SGML documents. Later, HTML was reformulated (version 2.0) to be more of an SGML application, however, the HTML markup language has many legacy- and exception- handling features that differ from SGML's requirements. HTML 4 is an SGML application that fully conforms to ISO 8879 – SGML. 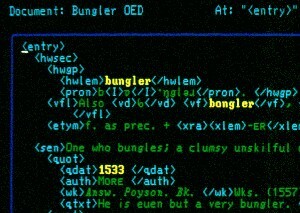 The charter for the 2006 revival of the World Wide Web Consortium HTML Working Group says, "the Group will not assume that an SGML parser is used for 'classic HTML'". Although HTML syntax closely resembles SGML syntax with the default reference concrete syntax, HTML5 abandons any attempt to define HTML as an SGML application, explicitly defining its own parsing rules, which more closely match existing implementations and documents. It does, however, define an alternative XHTML serialization, which conforms to XML and therefore to SGML as well. Other document markup languages are partly related to SGML and XML, but—because they cannot be parsed or validated or other-wise processed using standard SGML and XML tools—they are not considered either SGML or XML languages; the Z Format markup language for typesetting and documentation is an example. Text Encoding Initiative (TEI) is an academic consortium that designs, maintains, and develops technical standards for digital-format textual representation applications. HyTime defines a set of hypertext-oriented element types that allow SGML document authors to build hypertext and multimedia presentations. 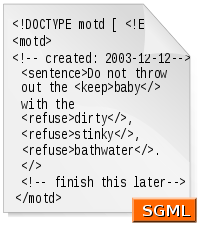 SGMLguid was an early SGML document type definition created, developed and used at CERN. ^ ISO. "JTC 1/SC 34 – Document description and processing languages". ISO. Retrieved 2009-12-25. ^ ISO JTC1/SC34. "JTC 1/SC 34 – Document Description and Processing Languages". Retrieved 2009-12-25. ^ "ISO/IEC TR 9573" (PDF). ISO. 1991. Retrieved 5 December 2017. ^ Goldfarb, Charles F. (1996). "The Roots of SGML – A Personal Recollection". Retrieved July 7, 2007. ^ Goldfarb, Charles F. (1990). "The SGML Handbook". ^ Wohler, Wayne (July 21, 1998). "SGML Declarations". Retrieved August 17, 2009. ^ Egmond (December 1989). "The Implementation of the Amsterdam SGML Parser" (PDF). ^ Carroll, Jeremy J. (November 26, 2001). "CoParsing of RDF & XML" (PDF). Hewlett-Packard. Retrieved October 9, 2009. ^ "Re: Other whitespace problems was Re: Whitespace rules (v2)". ^ Bruggemann-Klein. "Compiler-Construction Tools and Techniques for SGML parsers: Difficulties and Solutions". ^ "HTML 4–4 Conformance: requirements and recommendations". Retrieved 2009-12-30. ^ Lilley, Chris; Berners-Lee, Tim (February 6, 2009). "HTML Working Group Charter". Retrieved April 19, 2007. ^ "HTML5 — Parsing HTML documents". World Wide Web Consortium. October 28, 2014. Retrieved June 29, 2015. ^ Dubost, Karl (January 15, 2008). "HTML 5, one vocabulary, two serializations". Questions & Answers blog. W3C. Retrieved February 25, 2009. ^ Cowlishaw, M. F. (1987). "LEXX—A programmable structured editor". IBM Journal of Research and Development. IBM. 31 (1): 73. doi:10.1147/rd.311.0073.